The Melton Community First Responder (CFR) group provides voluntary support to the East Midlands Ambulance service (EMAS). When someone is suffering a potentially life-threatening illness, a member of the CFR group can often arrive before the emergency ambulance since we all live in the area. In these cases the 999 control desk will task the closest member of the group to provide assistant whilst the regular ambulance is travelling to the scene. In time-critical illnesses this can mean the difference between life and death although, in the majority of cases, the early initial treatment can provide relief or just ease the patient’s suffering. This is not just a paper exercise; during 2014 the group attended 1700 incidents, including 18 cardiac arrests. The group was set up in February 2004 under a partnership agreement between East Midlands Ambulance Service (EMAS) and St John Ambulance (SJA). St John Ambulance provided some equipment, training and support to the members. 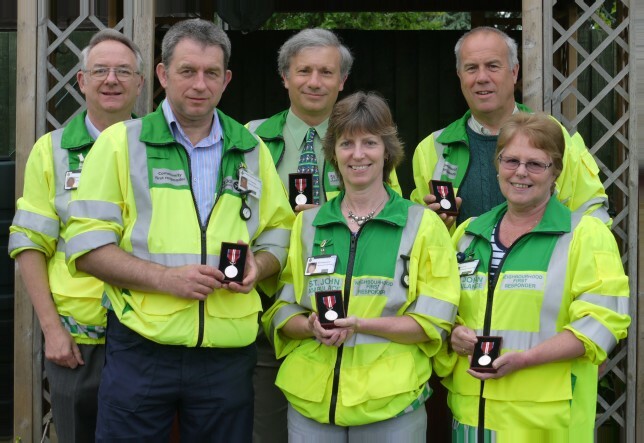 In 2007 Melton councilor Ron Marks, during his year as Mayor, named Melton Community First Responders as his charity for the year and bought the group much needed equipment. Although the arrangement with St John Ambulance had worked well for 11 years, after a mutual agreement between EMAS, SJA and the CFR group it was decided that the group would benefit by being independent, working directly under EMAS. This transfer took place on the 1st March 2015. To ensure that there was no disruption to our service, all equipment provided by SJA has been transferred to the group. Under the new arrangement with EMAS, some members of the group elected to undergo further training which increased their range of skills enabling them to attend a wider range of incidents, including young children and minor trauma. This has proven to be a great benefit to the community. The move away from SJA has increased the need for the group to raise its own funds. Although the ambulance service replaces consumables used we need to provide our own equipment including the defibrillators. Whilst we have equipment at the moment, some of this is 10 years old and will eventually need replacing. We are not a registered charity, with the charity commission, but we are registered with HMRC as a charity for Vat and gift aid purposes. We rely heavily on donations and help from other charities including Trumpton (Melton fire brigade’s Christmas appeal), The Lions, Round Table, Rotary Club and groups that fund raise at their meetings or individuals.